​Laura Calhoun, will be present, giving Bodywork sessions for Yogis and teaching Fee Flow QI workshop, we will move into meditation. The island is located off the northeast coast of Mexico, part of an ecological reserve, separated from the mainland by a shallow lagoon that is home to over 150 species of bird. 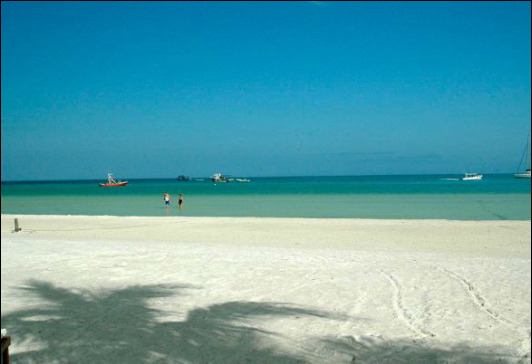 Holbox is a Mayan name that translates to ‘A black hole' a place where time and space seem to disappear. That is the effect the island has on its visitors; deeply relaxing the mind, body and soul. It is a quiet, spacious oasis with no public cars on the island. Spring and Summer, Meditation walks, day trips and retreats in the Poconos Mountains Pa. This is a practice that draws on the Eastern bodywork technique of Zen Shiatsu and yoga. In this practice we will learn a sequence of the pressure point that map our body, unblocking, stretching and toning the meridians. Our bodies are in constant flux between balance and imbalance. This practice will enhance the flow of lymphatic fluid, balance and stimulate immune, endocrine and nervous systems. Deep relaxation. in Brazil, hoping do it in Bahia will post information soon. Itacaré is in the cocoa zone of the state of Baiah in Brazil. Located 70 km north of Iheus where the Rio de Contas, which comes from the Chapada Diamantina, meets the Atlantic. Itacaré was founded as a Portuguese colonial settlement, originally called São Jorge dos Ilhéus, in 1532. The town was a notorious hangout for Dutch and Portuguese pirates during the early colonial period and later became a hub for the cocoa planting and a port for whalers. It was officially given city status in 1881. It is a popular destination for surfers, hikers, white water rafting and ecotourists. The town has a series of beautiful small cove type beaches and other picturesque beaches further along the coast. Itacaré is on the edge of a national park, one of the last large expanses of Atlantic rain forest left in Brazil.